The wave and current were too strong. Not suitable for beginner diver. Only one instructor was available on the boat. This was such a cool adventure! My wife and I have always wanted to try SCUBA, but did not want to spend all of the money required to become certified this trip gave us that opportunity! We were contacted by the company a few weeks in advance to set up a pick-up location in Waikiki. On the day of the excursion, we were picked up on time and brought right to the dive shop where they got us fitted for everything we would need. We then went to the harbor where our boat was waiting. After a quick and easy SCUBA tutorial on shore with one of their experienced dive instructors, we were off to the dive site. They did 2 separate dives and we got to see so much! the highlights were a sea turtle and a white tipped shark. After the excursion, we were driven back to the hotel in Waikiki with all afternoon to spare. This is an excursion for both those with and without certification, so do not be intimidated or think you are in the wrong place if you show up and find that everyone else is certified. 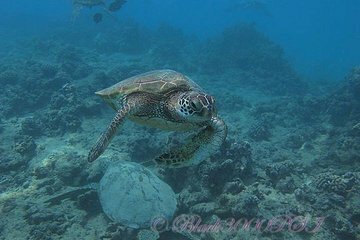 They did a great job with us newbies, and I would highly recommend this excursion if you are interested in SCUBA and want to see a side of Hawaii that many do not see. The Waikiki Dive Shop is 100m from the Marine Surf Apartments where I am staying. I met the team there and after a friendly and thorough a group of 9 divers, 2 instructors and a Dive Master set off on a 45 minute drive to Turtle Canyon. We loaded the dive gear into the waiting boat and were quickly on our way. After a 20 minute sail we arrived at the dive site. Because I am an experienced diver albeit one who is out of practice, I was paired with the dive master and we were first into the water. The water was remarkably clear and rivals the Great Barrier Reef in Australia in its clarity. During a one hour dive in depths of up to 11 metres we saw lots of hard and soft coral of various colours including purple, green and yellow. There were lots of fish of various colours and sizes. We encountered a couple of turtles and had a play with an octopus. Once my air reached 80PSI we headed back to the boat for a 15 minute rest and to change into the 2nd tank. The 2nd tank was smaller so the dive was only 40 minutes duration. Again we saw turtles and lots of fish plus another octopus. Once everyone was back on the boat we headed for shore and back to the dive shop. The Waikiki Dive Shop people are Hooghly professional, very friendly and helpful and made me feel very safe. I really enjoyed the day and I recommend it to novices and experienced divers alike.